Compliment: Just a great job with your music selection…how can I support you from a coastal town in Delaware!!! Appreciation! : Love your morning news, with Joe and Dred plays my favorite rock…..big fan. Great way to wake up, any day. And any day is a good day to wake up to KOZT. Also loved the 4th July live broadcast. Thanks everybody at KOZT…like a little bit of local magic spread all around. I recently moved to Faboulous Fort Bragg to be closer to my daughter who lives in Gualala and just love your radio station. I love the music you play and I love Sunday mornings with the Beatles. Thank you and please don’t ever change. The LEAST cookie cutter, corporate and commercial radio station in the country. The BEST mix of current and classic tracks on any station since the glory days of progressive FM rock radio. The ONLY station I listen to. We love The Coast. We take you everywhere since we found your station three years ago celebrating our anniversary in Mendocino. We are currently listening to you in Fiji. Bula from Fiji, keep it rockin. Amy and Jaime. Sorry I tuned in late today to the rock quiz. I would have won this one as I was in that movie. Did a security gig at the Santa Monica civic concert. Best part of this message though is— I’m listening from Antigua! Coolest radio ever: I LOVE this station. I live in SC, but listen to The Coast on tunein as a favorite station on my tv sound system, an app on my iPhone to play on apple CarPlay in my car, and through Echo Alexa in my living room. I spend the whole day in Mendocino county. Great music – super DJ’s – and I’m enjoying the accessibility. I found KOZT when camping in Mendo about 8 years ago and fell in love with the station. I stream from home because there’s no other station like it in the Sacramento area. I even stream it at work, in an elementary school library. it’s a great station- a breath of fresh (coastal) air, if you will. Subject: playlist – I cannot begin to tell you how much I enjoy your playlist and style of presentation. While I’m not a fan of the Dead I don’t mind enduring them for all the music you play. The live music: ELO, Tim Hardin, Chris Issak and on and on, etc. Music I’d long ago forgotten but absolutely adore. My wife Paula and I went camping at Russian Gulch a few weeks ago and found your station on our radio. WE LOVE THE COAST!! Love the music and all the DJs. We now listen everyday online in Meadow Vista CA. Do you do fund drives?? Can we become members?? I am a DJ for NPR affiliate Capital Public Radio in Sacramento. I host a 4 hour opera show every Sat night from 8-12 and have had the show for 18 years….anyway…LOVE THE COAST! Keep up the great programming! I’m here in Scotland and it’s 6:54 a.m. 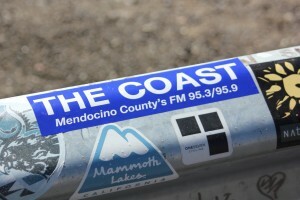 I tune into the Coast every morning – a great station that plays music I like. I just wanted to say I think this morning’s show is excellent. I’ve listened to you many times. I love the way you work in John Renbourn tracks. I opened gigs for him several times and he was a great musician – and now some Joni. Great way to start my day. I’ve been listening to ‘The Coast for a few weeks now and during that time after listening to your playlist from the time I go to sleep to when I wake up and a little after waking up and sometimes at work, I find my spirits lifted and feel inspires to move to Mendocino. Your station alone opens up dream ways, paths to a happier more fulfilling lifestyle. Thanks Coast!! Hey you folks. Listening to your great music from Thailand. My wife, Jeab, and I are here until early April. Then it’s back teaching kids in Berkeley. Love your music selections. Thank you. I recently moved to Lake Pillsbury from Marin & I discovered your station. It’s as if you went into my garage and inventoried my vinyl to create a playlist. Nobody plays country Joe anymore, it’s like KSAN of old. I am 66-year-old & grew up with our music. I don’t think I have heard any Procol Harum yet. Keep up the excellent programming. Bobby ‘G…..’ , off-grid fan. I hear your radio in Switzerland. I was for 14 Days in Mendocino and Fort Bragg and i hear the first time the coast in my car. Its very good music you play. I like it. Thank you very much. Greetings from Switzerland. Beat G.
Excellent music. Sitting at my law firm paralegal desk down in San Rafael. What a terrific set!! New Jackie Greene, Badfinger, now Don Henley. You guys are so great. I am glued to you all day over the Internet. I’ve always enjoyed listening to you on my way from the Bay Area to visit my daughter at HSU and now that I can stream you from my computer, it’s all good! The variety of music you play is so refreshing from any station I’ve ever heard. I also enjoy the hometown spirit you convey…I can pretend I live on the Mendocino Coast! Keep those great tunes coming and know I appreciate each one. Avid listener – I have listened to the Coast from all over Europe in my travels, including Spain, Italy and Germany. Now I’m listening from Oslo, Norway for the summer. One of the main things I love about your station–and especially your selections, Kate–is how many live recordings you play from concerts. They’re great listening. Also, I love the variety of music you play– from contemporary artists like Dave Matthews and the Black Crows to the great oldies like the Stones and Beatles. Keep up the great job! I’m gonna keep listening! I’m from Switzerland, traveling down Highway 1 with your awesome radio show… Carry on..! My husband and I have been dreaming of moving to Mendocino County for about 10 years and we bought or first Mendo home just over a year ago… not only was the move an awesome choice but when I found you on the radio, I knew that I was home for good! Praise: Someone finally figured it out. The perfect radio station. Seriously, I have lived in a lot of different states, countries, and places. This is the very best radio station ever. Anywhere. Ever. If I owned the station, I’d want it to be exactly what this station is. Hat’s off to you guys, you have an internet listener for life. Just don’t change what you’re doing, please. I’m a musician; I love hearing things no one else will play but you guys. Great stuff. Music with substance. Thank you. God bless. It’s 7 pm, Friday morning, “in the studio” is just over. A great show about the genius Stevie Ray Vaughan (Bought his records back in 83, 84, 85). I had to stop eating my breakfast for while this morning. Thanks for broadcasting this! I’m ready to go to office now. EDITOR: While listening to Mendocino’s KOZT radio station last summer, a female disc jockey provided a natural weedkiller recipe: one gallon vinegar, two cups epsom salts, a quarter-cup dawn dish soap. It is non toxic, works just as well as Roundup and is a third the cost. I tried it, and I am thrilled with the results. Just want to let you know that I’m still hanging on in in N.E. England having been introduced to you so many years ago, by my now sadly deceased cousin Hugh from Ocean Drive. Fact is you are still the best local radio station I ever tuned in to. Keep up the great work. Alan Waugh, Washington (the original) UK. Love you guys. We listen to you everyday,we are in zihuatanejo,mexico and get you on radiotime. Love your on air personalities, esp Kate and Marie. So happy to get to listen to Sunday morning with the Beatles. Stay great, fans of you all. Joanne – Queen of THE Krewe of Dreux XXIV – 1996 – Once A Queen, Always A Queen Happy Mardi Gras From New Orleans! Love the music you are playing for us while some of us locals are home in recovery mode today. AND the awesomely perfect pronunciation of laissez les bons temps rouler! Found you guys after Katrina when New Orleans had NO radio stations running. Been a true believer ever since. You are the first thing I turn on every morning when I wake up. EVERY day! Laissez Les Bons Temps Rouler! Hi from the Tirol Alps, Austria! hi you guys from us here on our skiing holiday in Niederau, Austria. No Lake Tahoe for us this year, we Brits are too broke so we have an apartment here instead. We always have The Coast is always on our player as it reminds us of holidays over on your side of the pond! And we like the time difference too, you’re small hours being our breakfast time Love to you all from Lyra aged two right up to Grandad Piers aged fifty- nine. Especially loving Pink Floyd, With Best Wishes to all on…. The Coast ! My work takes me all over the country and I listen to “local” radio as I travel. Few stations, if any, bring the community into the every day experience of its listeners – not only reporting it, but contributing to and forming a sense of place that contributes to the very special environment of Fort Bragg and the North Coast. We are indeed lucky to have such a valuable resource. (Ukiah phone number) THANK YOU! Hi nice people at KOZT. Jo Hall, Coast Card #4585, checking in with some pics from one of our adventures earlier this year. 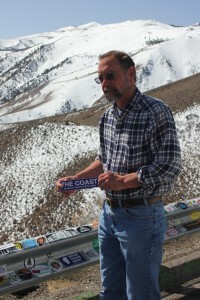 We were headed down Highway 395 between Carson Valley and Lone Pine on the Eastern Sierra Scenic Byway (one of the most glorious drives in California) and we took along a bumper sticker from the Coast that we acquired last July when visiting the station. We knew we would be traveling past the vista point at Conway Summit overlooking Mono Lake and, besides the terrific view, this spot is famous for the “bumper sticker” guard rail adorned with stickers representing everything from everywhere. My husband Michael packed yours specifically for this purpose and one photo is him proudly getting ready to adhere it to the “rail of fame”. And then there it is for all who pass by to see! Love your station. Keep the great tunes coming. Your folks have taken 40 years off my life. Now I’m young 40 in my mind dam this is great! Your radio App. Is on my IPhone, two iPads, one Apple Comp. so I’m 40 around the clock! Thank you, thank you! O! I’m in Simi Valley . WELL JUST THANKS! Bill.